Static E! 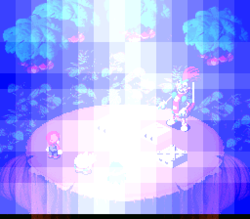 is an attack used by several enemies in Super Mario RPG: Legend of the Seven Stars that causes a blue, shimmering wave to cover the screen and, along with an interesting sound effect, deals minor electrical damage to all targets. In the Virtual Console version, the Static E! animation was altered to avoid potential seizures by removing the white flash, leaving it completely blue. ↑ TCRF. Super Mario RPG: Legend of the Seven Stars. The Cutting Room Floor. Retrieved April 25, 2018. This page was last edited on April 25, 2018, at 14:44.